What's the food that you have been wanting to taste like in forever? I have always had a number one on my list. My love for food grew when I became pregnant with my princess, was stuck at home due to sensitive pregnancy and my comfort was watching the Food Network on cable TV. Ever since I saw a documentary about southern comfort food, I was bought and I knew that one day my taste buds should savor as something as delicious as that. Finally, after several years I have had that taste that I had been looking for. I was excited when I received an invite from my good blogging friend Alaine of migsandalaine.blogspot.com to review a restaurant where Comedy Cartel PH would be performing. Her husband is currently competing for the leg and is a strong contender. I have been passing Big D's in Eastwood City Citywalk, which is located on the 2nd floor several times, since I work in Eastwood City and it's along the way, when I need to drop by the supermarket. Little did I know that it was a haven for outstanding food. Prepare your eyes and imagination while I share with you unedited photos of my taste bud adventure. 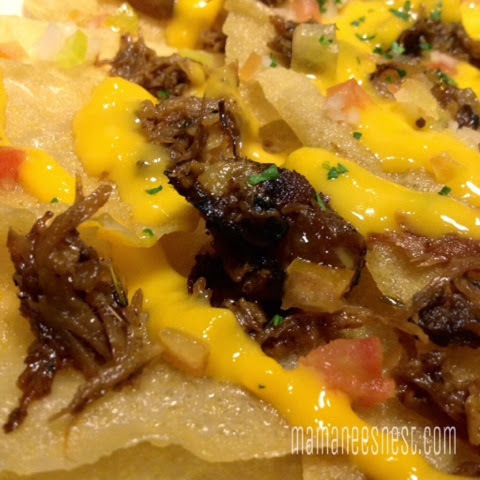 Say hello to Start up nachos with pulled pork. Pulled pork? 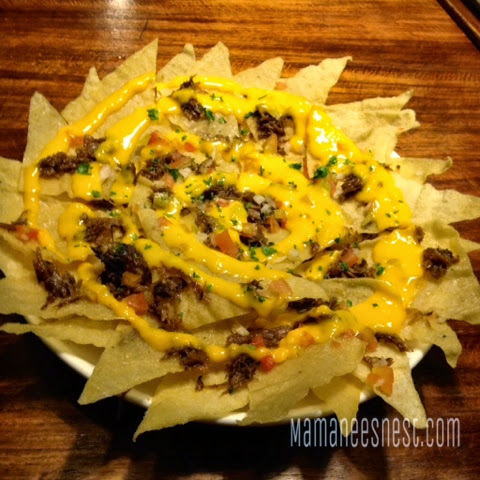 You may ask, well you don't get the usual ground pork or beef that you see with a nacho dish but what you get is tender pork pulls that are flavorful and melt in your every bite. It somehow reminds me of asado and the nachos are thin and crisp. 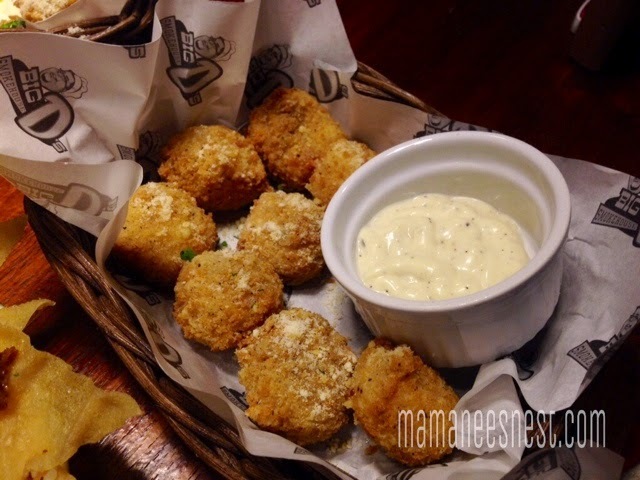 One of my favorites was these Hush Puppies, these are deep fried with roasted pimientos served with garlic dip. But the happy place is located inside. You get this croquet stuffed with 3 cheeses: mozarella, cheddar and parmesan. 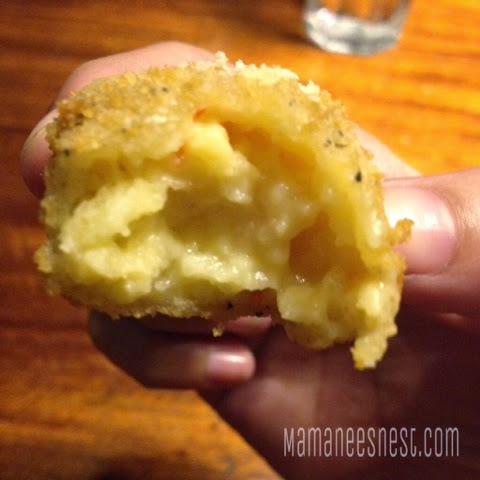 Crunchy outside, heaven inside and I loved that sprinkle of parmesan on top. According to Chef Dino aka Big D, this is his mother's recipe. 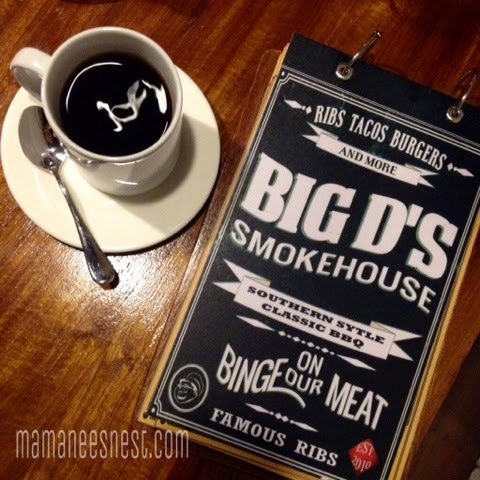 We had a chance to savor 3 of Big D's Smokehouse main dishes. 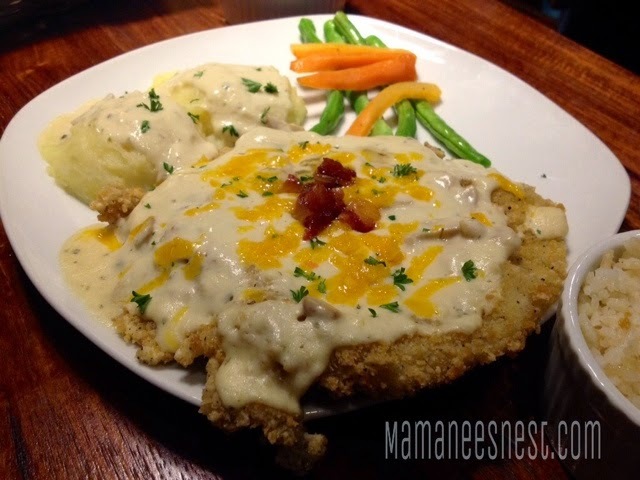 First up, Chicken Fried Steak with herbed gravy with a side dish of creamy mashed potatoes and vegetables. Honestly, I didn't get to taste this dish since I was on a chicken haitus (too much chicken from home cooking) but according to my co-bloggers it tasted great. Now, you have to be crazy not to love this. 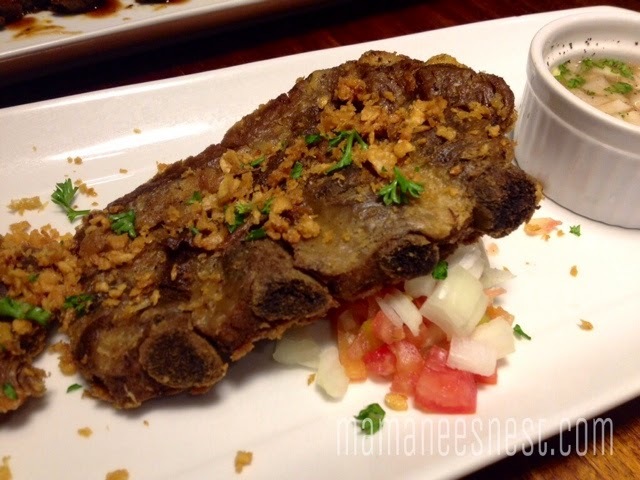 If you are a fan of crispy pata well this is so near to it without the guilt of all the fat. Big D's Smokehouse calls this Twice Fried Ribs. Super crispy and tender, I loved how with ease you could use a knife to slice thought it with ease to serve. The crispiness was light and you still have that flavorful taste of seasoned pork. 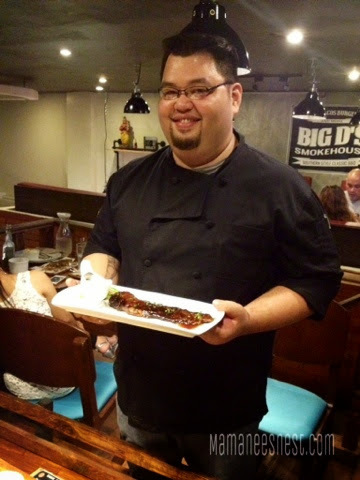 The third main dish served was one of the stars of the resto which makes up what Big D's Smokehouse was all about. This is a full slab of their Smoke Soft Bone Ribs. It's dry rubbed and basted in their special barbeque sauce and then smoked using imported wood chips whic seals in the flavor. 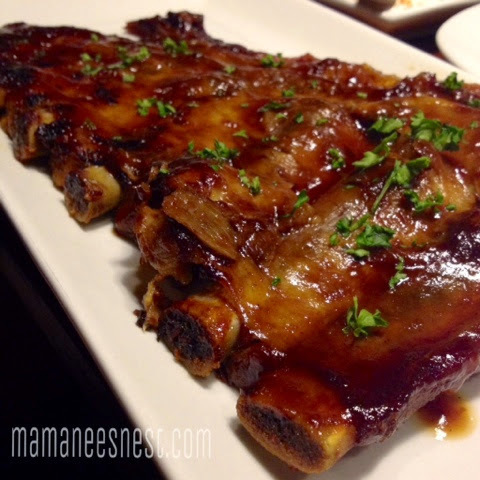 We're talking about tender, flavorful, melt in your mouth pork that you cannot get enough of. On it's own or with their in house barbeque sauce it's just sooo good! I even told Chef Dino that the sauce really reminds me of HP sauce which takes me back to the ribs in the UK. 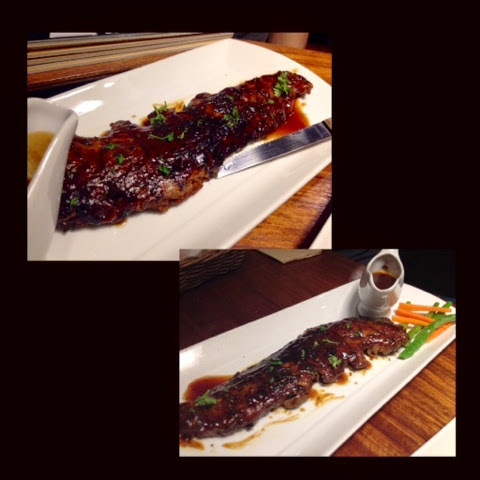 When I mentioned to Chef Dino my love for ribs in the UK yet I found the meat a little too tough. He asked me to try his full slab of boned ribs and see if I also found it tough. Truly honored since he has yet to launch this as a part of the menu, I happily agreed. I was impressed that the meat would pull away from the bone so easily and upon chewing the meat was definitely more tender than the ribs I had in my favorite fish and chip shop in the UK. Chef Dino served us with a cup of his kapeng barako which only cost 10php! Perfect place to meet up with friends for that coffe chat without the expensive fancy coffee, Big D's also serves cakes to side with that aromatic cup. Meet the man behind all this delicious food. He admits that his inspiration was based from the famous Southern US "comfort food" but putting in his own special touch to still delight the Filipino Palate. The amazing thing is that his ribs are all imported from the US which makes the dishes so much better in terms of tenderness and taste. 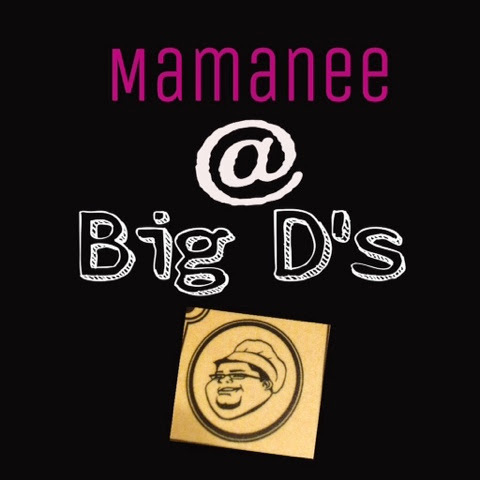 Big D's is definitely a place to bring the whole family to which will fill you up with complete satisfaction. 1. Serving size. It was never too much or too little. 2. Ambiance. The rustic feel with good food was definitely friendly for any type of foodie. You can wear relaxed clothing or come i dressed up. The restaturant's interior was amazingly designed by Chef Dino's Wife. 3. Location. Eastwood Citywalk 2. So near to everythng and perfect for the call center employees (like me). 4. Food. Well, I'm sure you read why. Hehe. 5. Chef Dino. Humble, passionate and jolly. 1. Benches. It was hard to get up when you wanted since those that wanted to stand needed to excuse everyone else to stand up to get around. With a small space that they occupy, individual chairs could have been more sufficient or maybe shorter benches, or better arrangement? We were seated updtairs in the corner. 2. Smiles. Not sure if the attendants were tired but they somehow forgot to smile a bit. So the "homey" feel to the resto went kind of bland. 2. Bathroom. The smell unfortunately was omitting to the dining area but I know this can be controlled with an automatic air freshener installed. In total, I would definitely suggest Big D's Smokehouse to anyone. The food will stand as the reason why. with contact number: (02) 376 6139.